This week, the Coronation Street Blog will celebrate its 9th birthday online and we're celebrating our birthday week by launching Coronation Street Blog - The Book! 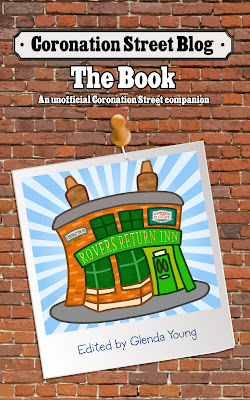 This unofficial Coronation Street companion book is an exciting mix of some of the best writing from our team of writers posted to our blog. Each member of our team (even Fat Brenda!) has picked their favourite pieces of work and we've put them all together in a great little book. The book contains exclusive interviews and opinion pieces too. Written by fans for fans, this book presents some of the most incisive, funny and engaging, writing about Coronation Street from fans that you’ll ever read. We pay homage to current characters and say goodbye to older ones. We rave about things we love about the show and rant about some of the things that we don’t. In short, it’s a love letter to Coronation Street. We hope you enjoy reading it as much as we’ve all enjoyed writing it! The book is available in paperback and as an ebook from Amazon. Eva - Let the heartbreak begin. What's your Coronation Street name?